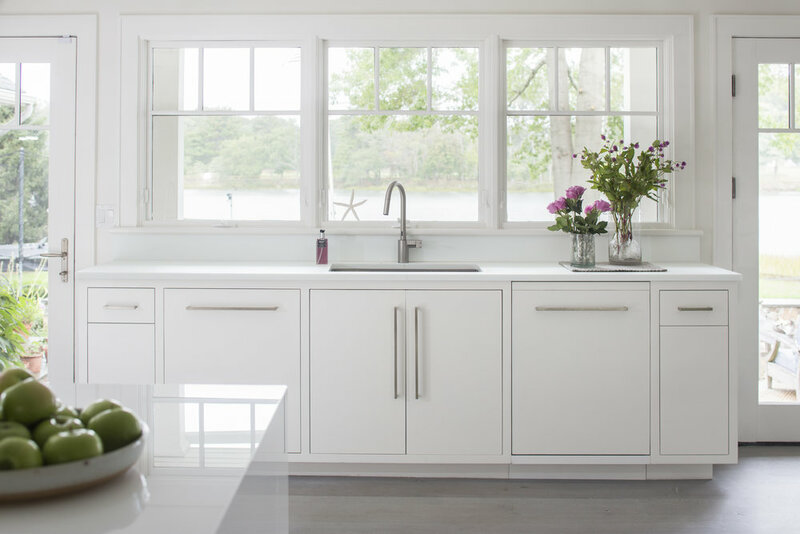 FEELING THE NEED TO CREATE A NEW AESTHETIC, ONE THAT RADIATED CALMNESS — THIS KITCHEN, MUDROOM + 2 BATH RENOVATION FOCUSED THE EYE ON WATER VIEWS AND CLEAN HORIZONTAL LINES TO INSTILL A SENSE OF ORDER AND LIGHTNESS. A DARK KITCHEN (COMPLETE WITH powder room on a waterfront-facing wall) had 6 WALLS with built-ins interrupting the flow. the powder room was moved to the mudroom and A new kitchen WAS DESIGNED WITHOUT UPPER CABINETRY TO CREATE A FLUIDITY OF SPACE, while contemporary + traditional mix in a flush inset on a slab door. the Appliance cabinet and message center/desk have doors that recess into cabinetry; so are cleanly closed when not in use. Ship-lap covers the walls in the mudroom where most of the visible trim around doors and windows was removed, thus blurring the interruptions of walls and closets — all necessary items for this busy family's lifestyle. vertical glass tile covers the walls in The mudroom bath, to offset the ship-lap outside its door, while a faux shagreen wallcovering sets the tone in the more formal entry hall powder room.